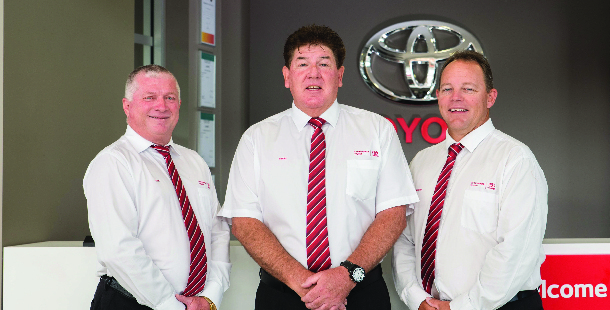 Toowoomba Toyota's, Toyota Fleet offers a complete range of services and finance packaged cars, along with a comprehensive range of vehicles - everything you need to help keep your business on the road. When you partner with Toyota Fleet, you're backed by the advanced engineering, innovation and dedicated customer support that's made Toyota Fleet the number one fleet brand in Australia and the dominant fleet provider to all segments of the Australian fleet market. As a Toyota Fleet customer, you also have access to a wide range of support and services including finance and fleet management solution, capped price servicing and the comprehensive Toyota New Vehicle Warranty. You'll have a minimum commitment: of purchasing 2 or more cars per year. The team at Toowoomba Toyota will be able to assist you with discussing your needs. So before you speak with anyone else, make sure you get in touch with Toowoomba Toyota! Minimum commitment to purchase 15 or more cars per year. Speak with the team from Toowoomba Toyota for assistance! Only Toyota offers Certified Toyota Fleet Specialists. A Toyota Dealership must prove exceptional dedication before being certified a Fleet Specialist. A series of Fleet-focused criteria must be met and confirmed annually. Fleet Specialist personnel must continually prove they have the knowledge and training to provide excellent customer service. A Fleet Specialist Dealership has dedicated Toyota experts with advanced knowledge of vehicles and efficient fleet planning. A Toyota Fleet Specialist makes better business sense for your fleet. Come in and talk to Toowoomba Toyota today!